An interesting box of metal Airfix clones … and the original Airfix Commando figures. I saw these strange metal mash ups of Airfix figures from the 1970s in a seaside antiques and craft market. I couldn’t identify them other than the plastic box marked Guisval. Guisval is a Spanish based diecast vehicle company established in 1962. The figures seem to be attached to military trucks and tanks, which are a marked Guisval Fabricado en Espana. They appear to be the equivalent of the British Matchbox Lesley and Dinky. Majorette diecast figures (on my Ebay recce / research) also had random plastic copies of Airfix figures. Not much shows up when researching Guisval metal military figures until I found one Flickr site – RMJ68. RMJ68’s figures by Guisval – the only other Guisval figures I found researching on the web. Please note: RMJ68’s photos are Copyright to their Flickr site – I have included them with credit to the author as part of my research into the figures I bought. 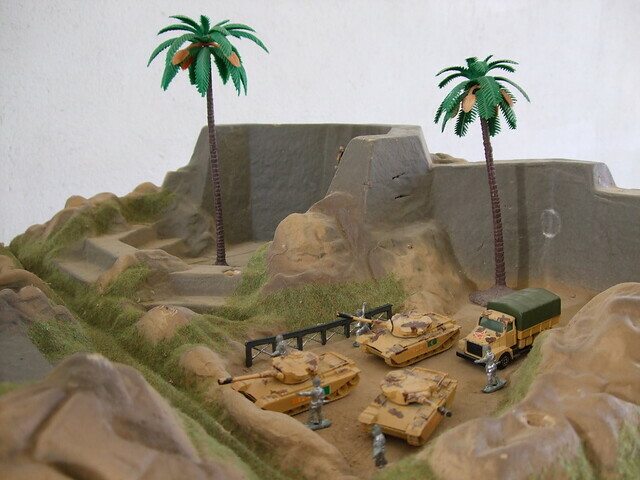 This set of Guisval related photos by RMJ68 shows these figures with tanks and lorries. Reading the Flickr comments, I am not sure that the plastic landscape and palm trees are Guisval issue or linked. Manufacture seems to be 1970s to 1980s. The box they come in seems purpose built clear plastic lid with yellow plastic base with strange base clips to attach them in transit and slide / release them. A similar type of clear box can be seen in RMJ68’s photos of Guisval military vehicles. Some tank or vehicle box bases have a plastic stud in the middle of the figure bases that appears in some of my figures to be broken off and still attached to the base. Airfix version 2 British Commando and the Guisval clones. Another Airfix British Commando and the Guisval clones. Familiar or classic poses of the Airfix British Paratroops are featured too – such as my smaller radio man and kneeling firing figure, rather than the Airfix second version Commando radio operator. In the RMJ68 photo examples are several of the much copied or pirated Airfix British Para poses which were never issued by Airfix in smaller sizes. These may have been pantographed down in size and then helmets altered. They are cast or painted in two colours – a dark bronze to browny black and a shiny silver metal. These might be different sets joined or intended, as in Green and Tan Army Men type toy soldiers, to be enemies (attackers and defenders) in different colours with the same poses. I hope that RMJ68 enjoys my pictures of these curious little Guisval metal figures. Blog posted by Mark Man of TIN 17 April 2019. Farewell Google+ Peter Laing pages (2017-2019). Blogposted by Mark, Man of TIN on April 1st / 2nd, 2019. Plastic joy! (In part, thanks to the Duke of Tradgardland). Blog posted by Mark Man of TIN on 29 March 2019. Close up on the baggy, chunky but slight detail on Peter Laing 15mm WW2 German Infantry that could be dual use for paratroops. I am currently painting up some 15mm Peter Laing WW2 German Infantry into dual 1940/41 use as German paratroops. Batch painting underway on these Peter Laing 15mm German Infantry / paratroops. The beauty of these first 15mm figures is that Peter Laing deliberately made them with slight and muted detail so that they could be easily converted by paint or file to other figures. These will be gloss paint or gloss varnish when finished. These 15mm WW2 German rifleman infantry figures have a bagginess of trouser about them that suits paratroop jump suits. Rifles were also quite widespread issue to paratroops, not all were carrying submachine guns. A quick uniform check out of the ‘best’ uniform book of my childhood (Preben Kannik’s Military Uniforms of the World in Colour) shows that such grey dual use figures are possible. This is what I still think 1940 Germans in WW2 look like … thanks to Preben Kannik. The Andrew Mollo Uniforms of WW2 book (1970s Blandford), familiar from the childhood branch library, had these slightly grainier, grittier, more photo-realist illustrations. Home Guard manuals of the time in my collection had interesting uniform plates – this book by John Brophy 1940. German Parachutists as shown on WW2 British Ministry of Information posters c. 1940/41 – note the camouflaged helmet cover. I’m not sure I fancy painting 15mm camouflage jackets or helmets in such detail as below on my Airfix figures or as Tim did in his excellent Tim’s Tanks Peter Laing 15mm WW2 Blog post. My previous paratroop camo painting experience was on a much bigger scale, about thirty plus years ago, tackling the camo from the Airfix packaging onto their then-newish 54mm German paratroop figures. I have recently rebased, renovated and gloss varnished these 1980s Airfix paint jobs for new use. I first painted these German Airfix Paratrooper figures in the early 1980s and they have hung around since then, getting increasingly bashed. I kept them as I quite liked the camouflage effects I achieved then with Airfix / Humbrol enamels. I must have been following the Airfix painting guide on the box backs or catalogues a5 the time, so checked this online. As originally painted (in Matt?) I wanted to get a little of the old gloss toy soldier style at a time when I had no lead hollowcast painted 54mm figures to base them on. I must have been reading old toy soldier books in the library. Three things were needed to refresh them for modern 54mm Skirmish gaming use. 1. A quick spruce up of the faces in old toy soldier style (pink cheek dots, the lot) matches the original old toy soldier style paint from the 1980s. 2. I have rebased them on tuppenny bases to add some weight. 3. A coat of (gloss acrylic) spray varnish to seal them for play. I have a few more unpainted ones lying around from job lots that I hope to paint in a similar toy soldier gloss style to match these figures. Then off to the “Operation Back Garden or Garten” this summer using Don’s parachute “confetti” paper shapes tipped out of a box or toy plane method of simulating airdrops? My local childhood branch library copy of Wargaming Airborne Operations … now mine! Blog posted by Mark, Man of TIN on the 24th March 2019.